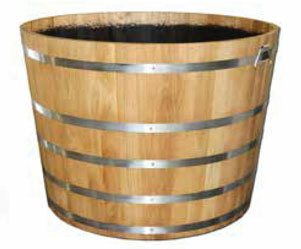 For Oak Tub Planter specification and price please call 02476 559 416. 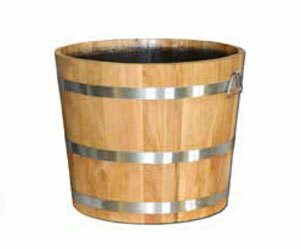 For more shapes and sizes, browse our full timber planters collection. Each product comes with a 5 year warranty. Prices starting from £234.99. 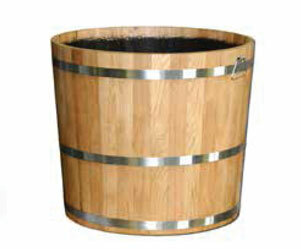 Buy quality Oak tubs with free UK delivery at Taylor Made Planters. The Oak planters in our collection are handmade and treated with oil to protect the wood from corrosion when planted outdoors. Available in three sizes and featuring a round, half barrel shape, each Oak barrel planter is highly versatile and suitable for a wide range of plants and small trees. For a vintage finish, each container is fitted with Stainless Steel rings and two sturdy handles. Here at Taylor Made Planters we only use legally harvested hardwood to craft our solid Oak planters therefore ensuring that every barrel is environmentally sustainable. We offer a range of sizes to suit a variety of gardens and outdoor spaces. Please contact us for a quote or ask our team any questions that you might have about our Oak barrels. We can offer a discount on large orders so call us on 02476 559 416 today to discuss your requirements.